During the month of July 1978, the political tension in Puerto Rico had been rampant. Several protesters had taken to the streets in order to further their message of Puerto Rican Independence. They were accused of several crimes, including the violent takeover of the Chilean Consulate on the island, which was used as leverage to demand that two protesters be released from prison. Rumors of a possible terrorist attack perpetuated by these individuals started to circulate on the island as well, adding to the political tension. On July 25th, 1978, two young men from the Independent Political Party were chased by police officers to the Cerro Maravilla de Villalba radio tower, where they were brutally assassinated for their political beliefs. These young men were later said to be implicated in the rumoured terrorist attacks, which is why the officers had been ordered to arrest them before the entire operation got out of hand. In order to cover up their involvement in the murders, the police officers tried to manipulate the evidence that was at the time available to them through the Criminal Investigation Labs. However, they were discovered and both officers were sent to jail. After this incident, the government feared that, if left unchecked, more police officers could abuse their power, and use the tools at their disposal for bad instead of good. This is when the Forensic Science Institute of Puerto Rico or El Instituto de Ciencias Forenses de Puerto Rico (shortened as ICF for its name in Spanish) was born. It was founded on July 24th, 1985 under Law #13 (“Ley 13”) which granted the institute fiscal, administrative and operational autonomy. The purpose of this law was to create an institution that would be entirely dedicated to the examination and forensic analysis of physical and biological evidence, as well as any documentation and digital evidence. This meant that it could then become an independent branch of our justice system. In order to create this institution, the government decided to merge the resources of the Criminal Laboratory of the Puerto Rico Police Force, the Forensic Medicine Institute of the School of Medical Sciences of Puerto Rico, and the Division of Technical Services of the Special Investigations Unit of the Department of Justice of Puerto Rico. After the government passed Law 13, there was finally some semblance of stricter control over criminal cases. Essentially, the Forensic Science Institute became our island’s last defense against crime. However, it was born amidst tragedy, and has known nothing but hardships ever since. Recent troubles have impeded the ICF’s ability to function at full capacity. In their most recent Strategic Plan, the institute detailed some of the struggles that it has faced over the years, which include: delayed cases, lost time, few personnel, lack of equipment and materials, among others. It is these issues that have left Puerto Rico with a less efficient judicial system, as well as a rise in criminal cases. As of 2014, the ICF had a total of 22,000 backlogged cases. This means that 22,000 cases were still waiting on evidence analysis in order to proceed in court. Yet, when court dates came around, the evidence failed to show up with them. How can this have come to pass? Let us clarify that the backlog does not consist of bodies waiting for autopsy, but of hundreds of DNA analyses, ballistics testing, toxicology reports, among other costly and time consuming procedures that are also necessary when considering a case. However, even if there is no backlog of autopsies, when one takes into account the sheer volume of bodies the institute receives, it seems likely that some of these procedures must have been conducted in haste, just to stay on track. For example, when a death occurs outside of a hospital, the body of the victim is taken to the institute in order to be autopsied. That body is then stored until a pathologist can examine it and conduct the autopsy. However, as of the publication of this article, there were only eleven forensic and anatomic pathologists working at the ICF, which means that as murder rates rise, the workload becomes extremely difficult to manage. 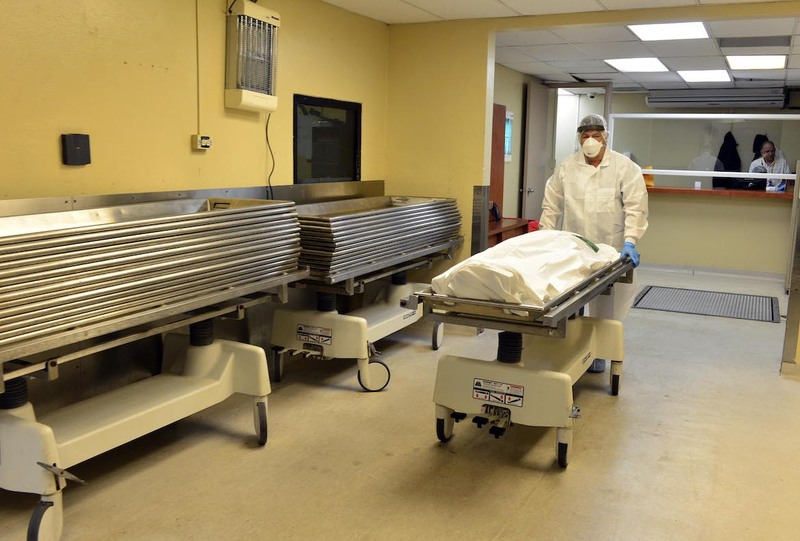 In 2012 a total of 13,087 autopsies divided among 11 pathologists were worked on, which means an approximate 1,190 autopsies per pathologist per year. If one takes into account the total number of work days that year, 241 days, and we divide the number of autopsies among them, you will find that each pathologist must have completed a minimum of 5 autopsies per day in order to meet that number. Considering that each autopsy takes around 2 to 4 hours, a pathologist in the institute is working 10-20 hours a day. Obviously, 20 hours is an unrealistic amount, which means one of two options: Pathologists are working less than 5 autopsies a day, or they are doing the minimum work required for each autopsy. As one factors in the days missed in order to go to court, sick days, vacations, etc, the overwhelming amount of work becomes even more evident. Yet, why are Forensic pathologists so scarce on the island? The answer boils down to one thing: salary. In the United States, the average salary for a pathologist is around $260,000 a year. Yet, in Puerto Rico, the ICF itself has claimed that it lacks the resources to afford adequate materials, let alone more pathologists. For this reason, many pathologists leave the island in search of better opportunities. As an aspiring forensic pathologist, it has become clear to me that in order to be properly rewarded for my labor, I will have to one day leave the island as well. A disappointing prospect which is shared by many students I have met during my college years, whom would otherwise prefer to stay in Puerto Rico. In the early months of 2017, what seemed to be the crecensendo of problems faced by the ICF came to its peak. On April 10, 2017, what is known as the “Ley 20” was passed, which created the Department of Public Security of Puerto Rico. This law effectively sets forth the consolidation of the following previously autonomous departments: the Bureau of the Puerto Rico Police, the Bureau of the Fire Department, the Institute of Forensic Sciences, the Emergency Medical Bureau, the Emergency Management Bureau, and Disaster Management, the Emergency Systems Bureau 9-1-1 and the Bureau of Special Investigations. The creation of this security department meant a budgetary saving of 28 million dollars per year and the creation of a more comprehensive and efficient security system on the island. However, not everything is as perfect as it seems. In a press conference, Carlos Vélez, President of Local 2099 of the ICF, explained that “the impartiality of the institute's investigations was precisely the engine that granted the institute administrative, fiscal and operational autonomy in the first place.” By eliminating the autonomy of the ICF, we have once again granted the government opportunity to abuse their power, and resort to corruption and cover-ups as they have proven to do in the past. Why would the government decide to make this drastic change? The reality is that this model of integrating security agencies has been implemented in the federal government before, a recognized example being the Department of Homeland Security (DHS) after the attacks in New York on September 11, 2001. According to Governor Ricardo Rossello, this measure will help consolidate administrative tasks under a single central administration, which will help the government save millions annually, and reinvest them in areas most in need. Sadly, after the onset of Hurricane Maria, these long-term problems have only worsened. Hurricane Maria was a Category 5 storm that struck on September 20, completely devastating Puerto Rico as well as other islands in the Caribbean. Weeks after the tragedy, there was a major disparity between the number of deaths that the government was providing and the ones the public reported. On October 5th, the ICF processed 200 death certificates after Hurricane Maria’s landfall, by which time the government was only reporting 34. They stated that the deaths had been related to patients that were interned at hospitals, but died due to a lack of energy to provide them with the care they needed. They also estimated the total amount of deaths to be close to 700. The Government of Puerto Rico later stated their estimate to be around 64. However, a recent study conducted at Harvard University estimates that the actual death toll after Maria is 4,645. Most recently, CNN has sued the government of Puerto Rico and forced them to hand over evidence of over 24,000 death certificates created after Hurricane Maria, in order to investigate their origin further. These discrepancies could possibly be attributed to miscommunication between government agencies, and also to the blatant amount of corruption that has been covered up for many years. Months after Maria, local citizens became concerned and outraged at the Institute’s overall lack of capacity to operate effectively in times of crisis. It came to a point where citizens demanded that the government take action, and investigate the Institute and why they were not being effective. “Resolution 584 was presented by the representative Ramón Luis Cruz Burgos and proposed to investigate the response capacity of the Institute in emergency situations, due to the inconsistency in the information offered by the entity to the government about persons reported as deceased after the step of the cyclone.” The Legislative branch ruled against this motion in December 2017. These years of turmoil have left us with a fragile criminal justice system. It does not matter if police officers are able to carry out arrests, if the evidence needed to actually sentence the criminals never makes it to the courtroom. The dismal lack of resources of the ICF has quite literally left our island defenseless against crime. Delays in the processing of cases causes missed court dates which leads charges to be dropped. As our murder rate rises in 2018, the strain put on the only remaining pathologists reaches near a breaking point. Yet, I firmly believe there is still hope. Thanks to the work of protesters and government representatives, the Ley 20 was recently amended to guarantee the Institute’s autonomy, and ensure that its sensitive information is not once again at risk. As for the Institute’s struggles with accessible funding, I have found that they could be eligible for the Coverdell National Forensic Science Improvements Grant, which is a federal resource that has provided funding to national institutes similar to the ICF, so that they can improve and maintain their equipment and continue to be more efficient in their work. Considering the problem of pathologist’s salaries, I understand that the ICF can take advantage of the new Ley 20 to reach agreements with the other departments to provide additional benefits to pathologists - be it better medical and dental plans, subsidies, trainings - to help counteract the low net salary they receive. While this measure would help retain more professional staff, the ICF should consider providing incentives to university students who wish to intern with them, which would help them distribute the workload more fairly, and in turn help with the problem of backlogs. Not only would this improve the institute’s efficiency, but by implementing this option they would provide students the opportunity to gain experience before they join the workforce.